Rossi Skincare had been on my radar for a while and I took the plunge to make a purchase. For an overview, Rossi products are free from synthetic ingredients and the range consists of products for face, body and hair. Products are made in Britain, carry the BUAV Leaping Bunny logo and the company supports The Clean Oceans Project. This all made for a great first impression so I was keen to test out a product. I ended up buying the Cocoa Butter & Grapeseed Hand & Body Lotion whilst searching for a new hand cream. The packaging is very sleek and I like the airless pump which is practical and keeps the product free of germs. Since this formulation is a lotion it has a lighter consistency but I have found it effective. This is ideal for those who prefer a cream that sinks into skin quickly without leaving behind a heavy residue. It has been suggested (thank you Andy) that balms may not be ideal for my Seborrhoeic Dermatitis so I have started using this lotion on my chest and back. Using a lotion appears to be working in my favour but it is early days. As you know I scrutinise ingredients and Rossi do provide a full list on their website. The ingredients are simple - Purified Water, Grapeseed Oil, Plum Kernel Oil, Emulsifying Wax, Virgin Cocoa Butter, Vegetable Glycerine, Aspen Bark Extract, Vitamin E. I chose this cream because there are no added essential oils making it ideal for my sensitive skin. When I use this lotion I can smell the plum kernel which gives a delightful hint of fragrance that reminds me of marzipan but it quickly fades. If you are concerned about preservatives, based on my understanding of ingredients, Rossi must be using Aspen Bark Extract and Vitamin E as their preservative system. I know there will be Green Bloggers who are knowledgeable about the chemistry of natural preservatives, of course they do have their flaws and it is often debated whether they are as effective as parabens. Aspen Bark has medicinal purposes and is suggested to help eczema. The bark is rich in salycin an aspirin-like substance, which is analgesic, anti-inflammatory, calming and healing to the skin. Test results show that it is highly effective at inhibiting the growth of mold and yeast. The use of Vitamin E as a preservative appears controversial with many arguing it is not fit for that purpose. I welcome any comments on this topic as it is an area where I would like to expand my knowledge. 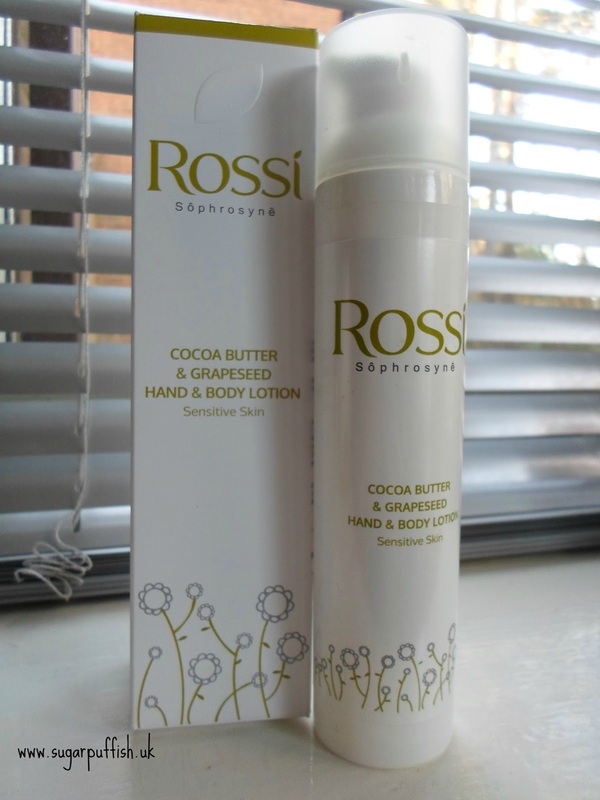 Putting ingredients to one side, I like using Rossi Cocoa Butter & Grapeseed Hand & Body Lotion. If you prefer lotions to butters I would suggest giving this a try. The fact that Rossi offer an unscented product wins brownie points with me. It is also available in Lavender & Orange should you prefer a scented cream. Rossi products can be purchase direct from their website but I bought mine from *Love Lula. I've not heard of this brand before! Not sure on the preservative system...I guess they would have tested it thoroughly before putting it on sale? Vitamin E is an effective antioxidant so its probably been added to prevent the fats from going rancid rather than for inhibiting moulds, yeasts and bacterial growth. But I suppose that is a form of preservation.